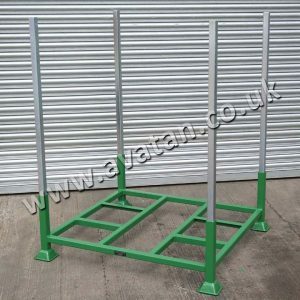 With over 20 years of experience supplying the storage and warehousing industry, Avatan have taken the simple Post Pallet and developed it into a form of ready to use Pallet Racking. 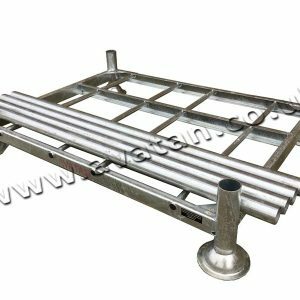 Manufactured throughout from mild steel box section, each Postrack comprises a well braced supportive base and a set of four removable posts and may be assembled in moments to create an instant post racking system. In keeping with conventional pallet racking, the Post rack (or Post Racking) will accept palletised loads of varying base dimensions and height, ensuring that the superimposed load is held safely and securely minimising risk to product and personnel. In addition, we brace the Postrack base to ensure that fork lift trucks will pick up on three or four base members minimising risks and ensuring safe handling. 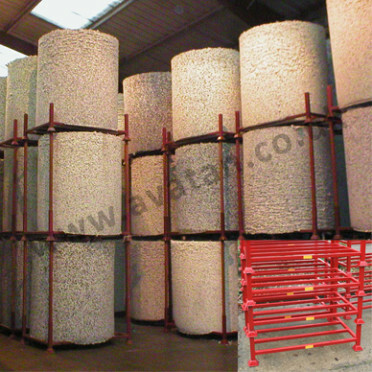 Post racks, available for sale or hire, may be stored in lanes, with an aisle between each lane, in line with ordinary racking, or alternatively may be block stacked to utilise all available floor space. This efficient use of storage space is especially suitable for non-perishable items and products where first in last out is acceptable. SP Postracks are also particularly efficient for the storage of rolls of materials, carpet, underlay, packs of timber, plastic pipes and other extrusions. Also available within the range of Postracks is the rigid Stakrack. This extremely strong rigid assembly nests efficiently when empty, minimising space required when not in use, and stacks securely one on top of the other to accommodate over 1400mm high palletised loads. This item is only available for hire and is not available for sale. Long and short term rental terms are available. Postracks may be manufactured to suit your own special requirements taking into account the height and weight of the contents you wish to store. Please call us or complete details on our enquiries pages for further details.